DLNA - good idea, poorly executed? After having tried to get things going through DLNA, I'm not convinced it's really useful at this stage. UPDATE: Response from Samsung customer service. One of my relatives has a pretty nice setup at home. Two large widescreen sets, a 24" Apple iMac, a Toshiba netbook, a Dell notebook (work), a Bose Lifestyle system (the one that caches CDs onto its hard disk and doubles as a DVD player) and a Nintendo Wii. One of the TV sets is connected to a Western Digital "WD TV Live". This will happily play from local USB connected media, from youtube, from online movie services (not really available in Australia), from SMB/CIFS shares and DLNA servers. It also presents its local storage devices via SMB/CIFS (via Samba in its firmware) for remote management by compatible devices on the network. For the price, it seems like a pretty capable little device and my relative (not a technical person) can happily operate the device and play media from its local storage. The other TV set in the house, a Samsung Series 8 LED backlit LCD set includes network support built into the television. With both an RJ45 jack and wireless USB dongle, it connects into the 802.11N access point he has. With a token set of internet connected "applets", it also has youtube access as well as DLNA support. It shouldn't need a separate, external appliance to play media from his network.. and it doesn't.. HOWEVER the experience is severely lacking. You go into a series of bland folders and then eventually drill down to the content you want. Content selected, one hits the select button. With blessing of the gods and (more importantly) hopefully appropriate codec support, music, photos and video are displayed. It's video, however, where the experience fails horribly. As more content becomes digital, similar to how my relative can already cache their audio CDs in their Bose system, it's reasonable to expect that not only a person's short family movies, but also longer, feature length media will be streamed from storage devices elsewhere in the house to multiple sets.. One expects the experience to be the same - you select your content, and can then pause, stop, rewind and cue as required. That's where, with DLNA, you'd be wrong. The ability to fast forward and rewind (and in some cases pause) video being streamed via DLNA just isn't there. In my googling on the issue, I stumbled across the following post from a Samsung product representative with regards to DLNA video playback control. I don't know about you, but the ability to fast forward and rewind digitally stored media - to randomly access non-live digital media - is one of the reasons why digital is powerful, why it's useful. In my mind, this renders DLNA useful for not a great deal beyond, perhaps, implementing a poor man's iTunes or a network connected digital picture frame. Perhaps other DLNA servers (I tried Samsung's own, EyeTV and Windows 7 Media Center) and clients (I only tried the WD TV Live and the Samsung Series 8) have this functionality... I'm pretty sure more proprietary solutions like Sony's PlayStation and Microsoft's XBox do. 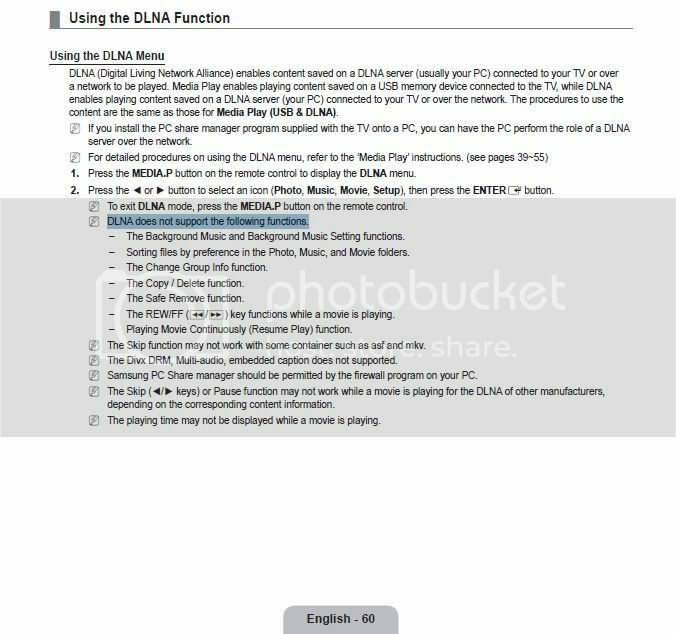 Subsequently, I'm now looking into alternate options, potentially a dedicated media NAS + network appliance for the Samsung set, effectively rendering my relative's investment in a DLNA capable set pretty much useless (To be fair, besides the poor network connectivity, the set has an excellent picture).